A small independent family run business. The Beatwear brand has been supplying high quality sixties style men’s cuban heel boots and clothing since 1993, founded by Mark Astbury, the original boots (just the Original Chelsea and Cavern's to begin with) were sold out of our mens shoe shop in Cavern Walks on Mathew Street in the Cavern Quarter of Liverpool, England. Over the years we have moved around a bit - a couple of locations in Liverpool City Centre, ...and we also had an additional pop-up store in Camden Stables Market in London for a short while. Currently Beatwear is trading online only due to relocation. Beatwear has also been known to have a stand at Beatle Conventions around the USA and every August Beatle Week you can find us at the Adelphi Hotel, along with various other trade and music shows throughout the year. We now have a growing number of stockists coming on board selling our Beatwear products, check out our stockists tab to see where they are. • Boots: Our inspiration for the cuban heel boots came from the ones worn by The Beatles, The KInks, The Stones and their contemporaries in the 1960's. We think it is still an iconic timeless look, and thankfully a lot of you agree with us! Our sought-after Beatwear boots come in eight fabulous styles now, most have a core line of black Italian leather and suede but with a few other, and more wilder, extravagant colours thrown in to mix it up a bit. Some colours are Limited Editions as the leathers are hard to come by and in small quantities so you can be guaranteed a unique look! We offer a lower Cuban heel version in some styles along with the higher Cuban heel, as we know that the height is not to everyone’s taste. Since the addition of the DC5 and The Ringo styles, we now offer 3 different heel heights! The Beatwear boots are based on the original patterns and lasts from the 1960’s – but we have tweaked them a bit to give a more comfortable fit! Talk to those who wore the original ones back in the day and they will tell you they were certainly not for the faint hearted, (that's if their parents would allow them to wear the boots at the time - apparently not all did!) Our boots can now be lovingly worn for longer whether it is up and down the high street or night after night on stage. Each boot is handcrafted in small family run factories in Italy, made using the finest grade Italian Leathers and Suedes, the softest Italian leather linings and finished with an Italian leather sole (no resin soles on our boots!) … a quality product that we are extremely proud of – we are firm believers in the old adage … ‘you get what you pay for!’ With proper care, our Beatwear boots can last for many years - and we have quite a few customers that can vouch for that! The latest additions to the Beatwear Collection are the DC5 & the Ringo Range ...and the long awaited Women's range of Cuban Heel Boots, however quite a few women already buy from the smaller size range end of the men's! • Clothing: Our Beatwear clothing line is growing too, and is increasingly popular. We like to use English woven cloth where we can for our clothing range, chosen and sourced by us from British Woollen Mills, and finished by skilled and dedicated craftsmen. Our jackets and trousers have a slightly different fit to the regular clothes of today, it is a bit more snug and slimmer fitting just like they used to be in the days of the Beatles and the Kinks etc. 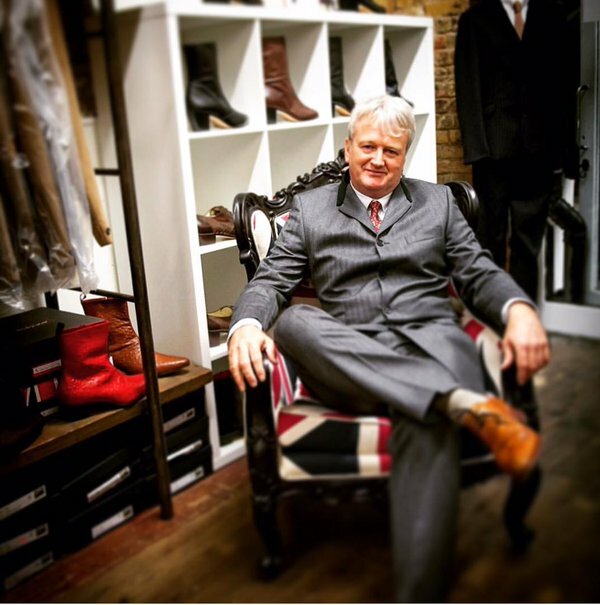 We have some that are replica's of the Suits and Jackets worn by the Beatles back in the day, such as the Shea Stadium Nehru Jacket, the Sullivan, the Chesterfield, the Hard Days Night and the Collarless Suits, plus some lesser known styles that we have researched, with those who know, for authenticity like the slick Mod Suits. The classic 1960's look never seems to go out of fashion. We have people ordering suits for their weddings, christenings, formals, for stage wear and just for everyday regular wear. To compliment our suits we have our fab shirts with nine different collar styles, all made in a lovely white cotton plus a couple of new coloured paisley designs. Our Beatwear coats have been a big hit with our customers too - especially when they come and see the quality of them in the showroom. The Beatwear Paul Pea-Coat being a firm favourite, based on the ones worn by the Beatles, the Stones, Steve McQueen and the like. We've just added a new range of accessories to help finish off that dapper look - with skinny ties, pocket squares and aviator scarves. Beatwear attracts musicians, bands and customers from all over the world – we are always amazed and honoured when people come over just to see us and buy from our Beatwear Collection! There seems to be no specific age range for our Beatwear customers, we have teens to silver foxes!, men and women … our Beatwear products can be found adorning people all over the world! Do watch out for them as they can be seen on major bands; performers; tribute bands; Musicians; Theatre Productions; Museums – The Madam Tussauds Group & The Beatles Story in Liverpool; Television and the film industry … as well as just regular street wear! Take a peak at our Rogues gallery to see some of our fab Beatwear customers wearing their gear! Beatwear is always about the quality of our products and the attention to detail, the mantra that we keep hearing over and over again is that "the pictures on the website don't do justice to the great quality of the product", and we're happy with that! We are a small family business, so that means there is only a few of us and we all do a bit of everything, no big automated impersonal service here. But that also means we know our products inside out as we are all on board from the design of the product to the end result, to populating the websites and to looking after the orders and the processing of the sales and getting them shipped out to our customers, and aftersales. We hope that you enjoy using our updated website and love our products, if you have any questions or comments please don’t hesitate to get in touch with us. The Beatwear brand & The webstores www.sixtiesbeatwear.co.uk and www.beatwear.com are part of Sixties Ltd.
** Why not follow us on social media too and keep up to date with our fab customer photos and Beatwear news. Links to our Facebook, Twitter & Instagram are just below... and get your picture on our Rogues Gallery! Don't forget to tag us in your Beatwear pics! 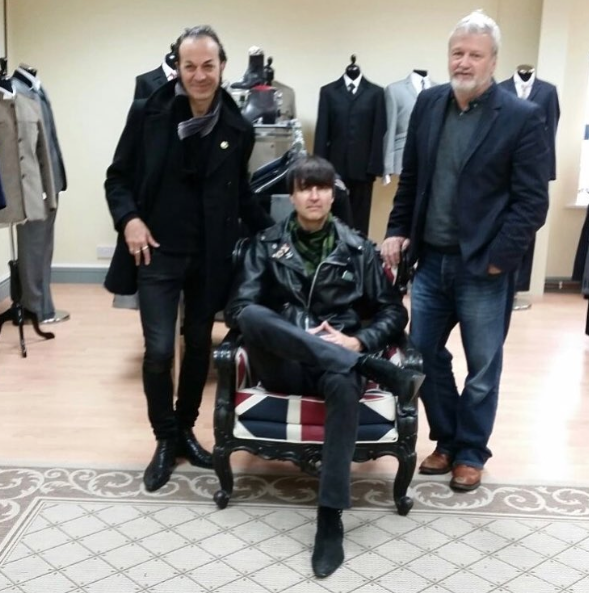 Mark Astbury (founder of Beatwear) here with Beatwear Customers "Twin Guns" in the Beatwear Showroom!